The Fellowship was fortunate enough to obtain a copy of E.V.I.L. 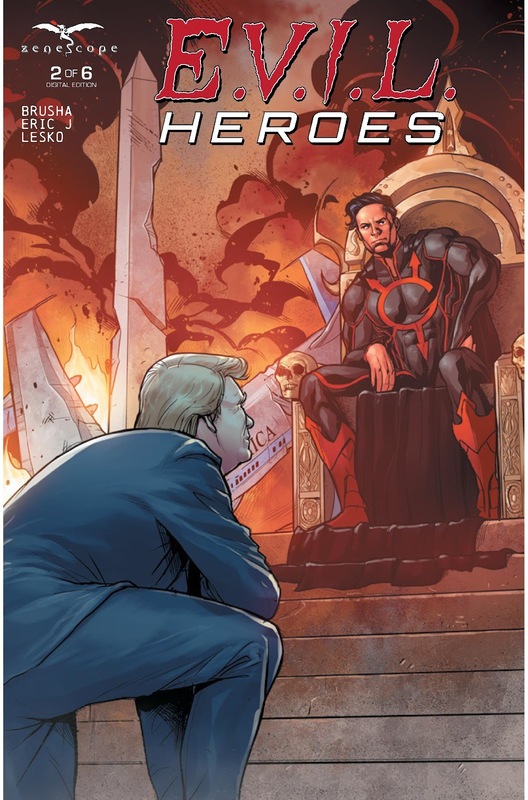 HEROES #2 from Zenescope Entertainment. The story is by Joe Brusha, with art by Eric J & Cristhian Crizam Zamora, colors by Marco Lesko, and letters by Matt Krotzer. The mystery behind the powerful beings deepens; they were on Earth before? The adage “fight fire with fire” seems to be in play here with our heroes gaining abilities of their own to combat the world’s new rulers. While the corrupted superhero is not a new concept, this issue we realize that there is more to the story. So stay tuned. Very nice artwork by Eric J, Zamora and Lesko; well done. This book is getting very interesting. Check it out. E.V.I.L. HEROES #2 is in stores now or available at www.zenescope.com.